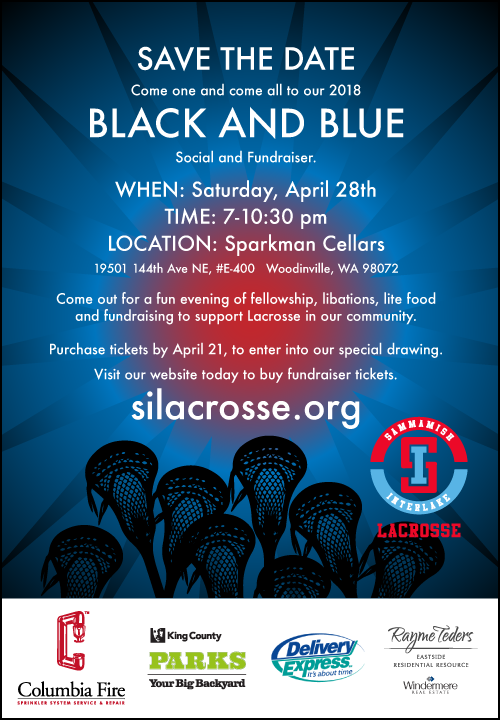 Mark your calendars for the 1st annual "Black and Blue" social and fundraiser for Sammamish Interlake Lacrosse. so we are better able to serve the youth in our community. These are key components to growing the sport of lacrosse in our area. With out your support this will not be possible. Come see what special merchandise, you can only get at the "Black and Blue" fundraiser. Stay tune for more details in your email box. I can attend, order me up some tickets. I can't make it. Would love to give additional support.